Filipe Rocha da Silva has long been fascinated with patterns and draws thousands of tiny figures in rendered expanses. In his earlier paintings and drawings, the figures are simultaneously human and calligraphic markings standing in for the human. From a distance, the forms in the works solidify into modernist shapes — a stylized mound, a grid of colors — or figurative landscapes. 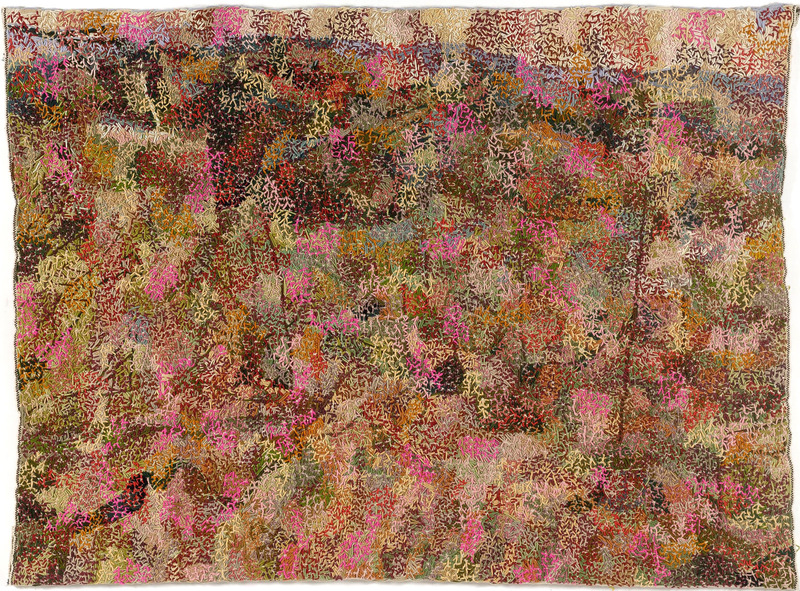 The textile works from his Contemporary Landscape series depict wild forest scenes, populated by tiny figures throughout, textured by the wool threads in all directions. As in his previous works, it is a world where the collective human presence is at times overwhelming, but nature persists and dominates. Rocha da Silva’s latest works — Room in the Kunsthistorisches Museum, Vienna (2017) and Fragments of Textile from Prato (2018) — from his Fragmented Culture series are created since the artist’s move to Florence, Italy, in 2016. They are inspired by his new surroundings and represent a new direction of fusing his personal and artistic history into his textile drawings. Filipe Rocha da Silva (b. 1954, Portugal) currently lives and works in Florence, Italy. He completed undergraduate studies in Arts Plastiques et Sciences de l’Art at the Sorbonne, Paris, France (1973), Fine Arts School, Lisbon, Portugal (1980) and Studio Art Centre International, Florence, Italy (1982), earned his MFA at Pratt Institute, New York (1985) and his Ph.D. in Visual Arts at Universidade de Évora, Portugal (2005). Recent exhibitions include: Filipe Rocha da Silva, Here to There: Textile Drawings, Art Projects International, NY (2018); Blurred Horizons: Contemporary Landscapes, Real and Imagined, Art Projects International, New York (2018); Post Painting, Centro de Artes de Tavira, Portugal (2017); Desenhos Têxteis, Fundação Arpad Szenes Vieira da Silva, Lisbon (2016); Bl, MUTE, Lisbon (2016); and Wool Drawing, Art Projects International, New York (2015). His work is represented in major collections, including the Calouste Gulbenkian Foundation, Lisbon, Portugal; Centro de Arte Moderna do Funchal, Madeira, Portugal; Centro de Arte Moderna, Museu da Cidade de Lisboa, Lisbon, Portugal; Museu de Arte Contemporânea, Fundação de Serralves, Porto, Portugal; and Museo de Arte Contemporáneo Unión Fenosa, A Coruña, Spain.